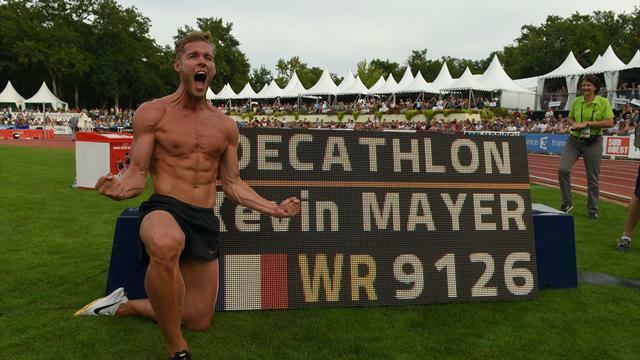 France's Kevin Mayer destroyed the decathlon world record at the Decastar meeting in Talence on Sunday, scoring an incredible 9126 points. The world champion needed just a 4:49 clocking in the 1500m to break American legend Ashton Eaton’s world record - and he duly delivered in style. Mayer started the second day of competition with a tally of 4563 points, 140 behind Eaton’s first-day total when he set his world record of 9045 points three years ago at the World Championships in Beijing. The Frenchman did not disappoint in completing the world record performance after having amassed 8421 points with the final event - the 1500m - still to go. “I’ve been waiting for this moment for a long time,” he said. “We live for moments like this that are simply incredible.
" I couldn’t cry. I don’t have any more tears left because I was crying so much before the 1500m." Mayer has become the first Frenchman to hold the decathlon world record. Incredibly, the 27-year-old made the biggest single improvement on a decathlon world record since Tomas Dvorak added 103 points to the mark in 1999. Mayer's heroics come on a memorable day for world athletics as Kenya's Eliud Kipchoge earlier broke the men’s marathon world record with victory in Berlin in 2:01.39.